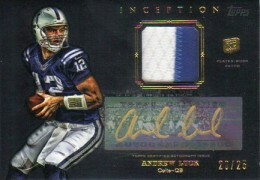 With Cam Newton and company breaking into the NFL last season, 2011 Topps Inception Football made a big splash with collectors thanks to its distinct look and loads of on-card autographs. 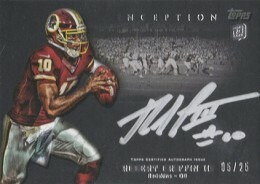 The company looked to strike twice with 2012 Topps Inception Football, a release that relied on another stellar rookie class and lots more ink. And while collectors are returning and singles are bringing in decent amounts, there doesn't seem to be the same buzz. Part of that is due to the fact that a lot of the key cards show a lot of edge and corner wear fresh out of the pack. But that's not stopping some bullish sales from going through. Particularly those featuring Andrew Luck and Robert Griffin III. 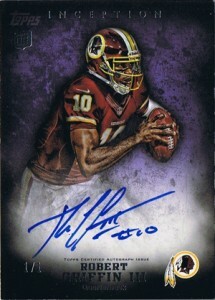 Out of the top ten sales recorded on eBay through July 22, 2012, one or both of the rookie quarterbacks are on every card in some capacity. The top online sale belongs to the 2011 Heisman winner. 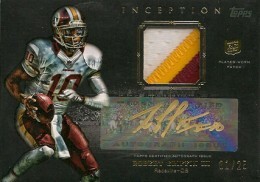 A one-of-one 2012 Topps Inception Rookie Autograph Robert Griffin III finished at $1,241. This despite having clear damage along its edges and at least one corner. The sale almost doubled the second highest eBay sale thus far. A pair of triple autographs headlined by Luck and RG3 filled the next two slots. 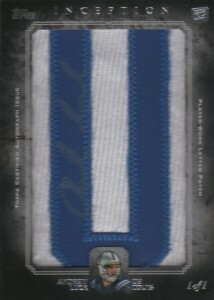 Numbered to 10, one of the cards sold for $685 while the second went for $620. The other player on the card? Ryan Tannehill. This is the only time someone other than Griffin or Luck appear on the list. Counting multi-signed cards, the de facto rivals each appear on seven cards. All but one has an autograph. 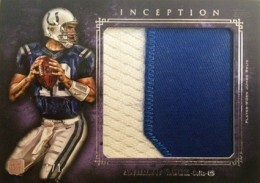 So far, the top 2012 Topps Inception eBay sale not to include either of the quarterbacks is a one-of-one LaMichael James autographed patch card. An interesting point is : A great value today but in 2-3 years? That was the case with Michael Vick, Alex Smith, Reggie Bush,… Many cards are really down now.